Today started slow because I had to go to 55th and 5th to use my Groupon before my stay in NYC was over. (Groupons are discounts on food, tours, events, etc., and they help save on expenses and encourage going to new places) I then went to TKTS and bought a ticket for the Broadway play, Waitress. Then, after asking three people, I found the train to Queens. According to my handy MAPS, I took a train and then bus. A kind young woman showed me how to use my metro card to buy a bus ticket. All went well until the bus driver on the M60 had never heard of where I wanted to go, the Museum of Art, a first. He dropped me off in the middle of excessive traffic, residents, and no museum. My MAPS directed me to the Bulova Corporate Center, a first. that was not the museum. A kind man in the Bulova building told me I was not even close. Therefore, I stood at a bus stop for 15 minutes. One bus stopped, and I asked if this bus went to the museum. He said, “NO,” and took off. It was close to 4:00 and I knew I needed to do something before it was dark. I saw a taxi with lights on, and I ran into the street to see if he could take me to the museum. I felt like I was in the movies. I scurried into the backseat, and discovered the driver had broken English, and he didn’t know where the museum was either. Twenty dollars later, and 45 minutes before closing time, he dropped me off at the museum. It was close to Citi Field, home of the Mets, and the Billie Jean King National Tennis Center. The museum was fabulous and worth the destination experience. 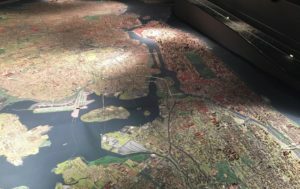 They have the Panorama of the City of New York, a first. 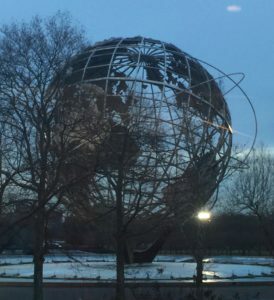 It has been there since the 1964 World’s Fair, as has the Unisphere. In 1992 the panorama was updated. It ‘s hard to describe. Every building, street, river, bridge, airport, etc. were laid out to scale for Manhattan, Bronx, Brooklyn, Queens, and Staten Island. They even had airplanes landing at LaGuardia Airport. Amazing. 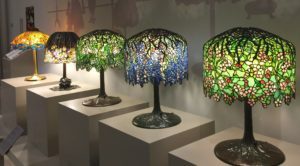 Another exhibit was Tiffany Lamps, a first. Each was incredibly beautiful. She said, “I am going there; you can go with me.” She said she was a curator at the museum. Thank you, God for all the help! They way we walked was nothing close to the directions I listened to so carefully. 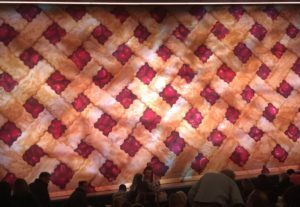 Back to Manhattan, I went to see the play Waitress, a first. It was, of course, great. I walked the twelve blocks home in the rain. Wow, what a day is right!